The insulting tip was allegedly left by white teenage customers for their black waiter at a restaurant in East London. 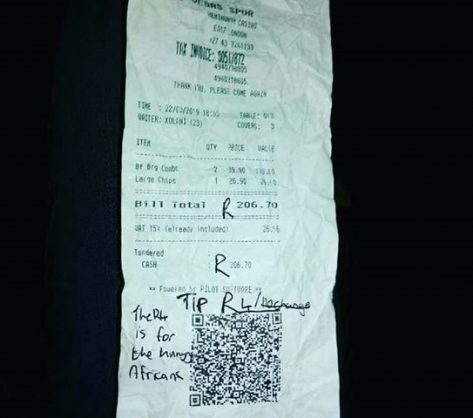 A case of crimen injuria has been opened by a waiter working at Las Vegas Spur in Hemingways Mall, East London, after a group of white teenage patrons left a R4 tip for their waiter, Xolani Mbalo, which they explained in writing, was for “hungry Africans”, the Daily Dispatch reports. It was reported that the incident, which took place on Friday evening, left the staff at the restaurant upset and that police were called to the steakhouse on the day. Mbalo, a graduate from the Walter Sisulu University, told the publication that the white teenagers were two boys and a girl who taunted him until he stopped serving the patrons. Mbalo said they allegedly made silly remarks when he served them their food and that they broke out in laughter when he asked them if he looked hungry in response to them asking him to eat their leftover chips. Mbalo said one of the teenagers had said he looked hungry and should eat their leftovers. The waiter said that when the teenagers were asked what they meant by what they wrote on the slip, they said they were adding hope for hungry children, adding that he gave them back the R4. The manager of the restaurant, William Hanker, reportedly let the teenagers go, which led to the waiters complaining. The manager reportedly said that, since the white teenagers had left the restaurant and had to be called back to explain themselves over the R4 tip for “hungry Africans”, Spur’s policy would not allow anything to be done to the patrons. The restaurant confirmed the incident in a statement posted on its Facebook page on Sunday. “Three teenage male customers were served by our waitron. They racially abused our employee and left a note on the till slip with a derogatory comment. Unfortunately, the waitron only brought the matter to the attention of management once the customers had left. “The management of Las Vegas Spur vehemently condemns this atrocious act and we do not condone [the] use of derogatory, racist, or sexist behaviour or language. Contrary to social media comments, management did not make light of this serious matter. We arranged counselling for our employee and have had further meetings with our staff. “Should our staff need to take this further, we as management of Las Vegas Spur will support them. We will always do our best to protect our employees and patrons against such actions as the safety, comfort and dignity of our employees and customers remains our main priority,” the statement reads.